Final score, +4: Things were going swimmingly for Pam and Jim, but Jim’s reaction to Pam’s job suggestion set the Pam Pong score back to zero and Pam spent the rest of the day trying to get back in Jim’s good graces. She managed to pull it off in the last couple minutes, but some concerns still remain. 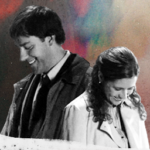 We see in this episode that even the slightest rejection from Pam hurts Jim very much. 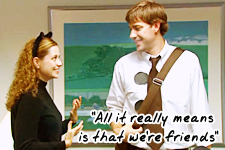 Since Pam’s engaged, we can only brace ourselves for the inevitable rejections Jim will suffer. But on the plus side, Pam recognized Jim’s hurt and did everything she could to make it better.